Welcome to Ask an Astronomer at Cornell University! 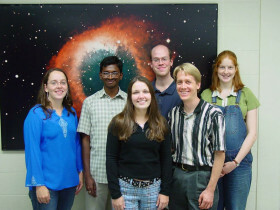 The Ask an Astronomer team, September 2004. Here some of us are lined up in Room 105 of the Cornell Space Sciences Building after the weekly Astronomy Colloquium. From left to right: Karen Masters, Jagadheep D. Pandian, Sabrina Steirwalt, Brian Kent, Marc Berthoud, Amélie Saintonge (and son, not yet visible).Since they first stepped out of the proverbial cave, humans have always been intrigued by the beauty and wonder of the night sky and the almost infinite possibilities of space. Indeed, astronomy is both the closest and the most distant science from common experience. Every curious person who gazes at the night sky becomes an astronomer, and yet the things we see in outer space are wholly outside our earthbound experience. That is why astronomy is both the oldest and the youngest science of them all. Oldest because almost every ancient culture, understanding the need to predict the coming of the seasons, became expert at tracking and predicting the motions of the Sun, Moon and planets. Many of the prehistoric monuments that still exist today are aligned in some astronomical direction or another. The Egyptian Pyramids, Stonehenge, and a panoply of Native American, Mayan and Aztec temples all are complex astronomical observatories designed for direction-finding or the prediction of the planets and seasons. The Ask an Astronomer team, September 2007. 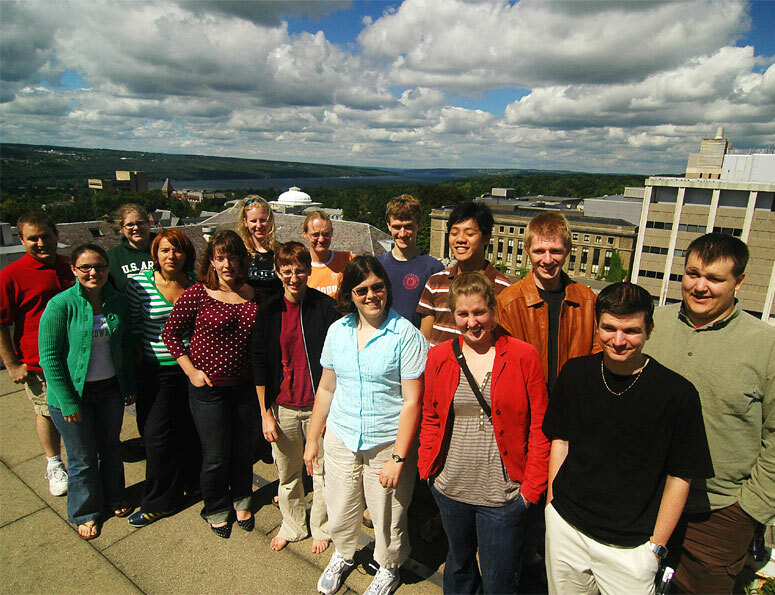 Here are some of us on the roof of the Cornell Space Sciences Building, with Cayuga Lake in the background. From left to right: (back row) Anthony Milano, Ann Martin, Shannon Gutenkunst, Laura Spitler, Ryan Anderson, Pon Tangmatitham, Drew Brisbin, and Carl Ferkinhoff. (front row) Sabrina Stierwalt, Barbara Rojas, Briony Horgan, Betsey Adams, Rebecca Harbison, Kassie Martin-Wells, and Istvan Laszlo.And yet astronomy is a young science, too. Only in the last century or so have we truly come to understand the size and age of the universe we live in; only in the last fifty or sixty years have we truly begun to understand the physics which drives the universe and makes exotic objects like black holes, neutron stars and a menagerie of other astronomical oddities possible. And finally, only in the last decade or two have we been able to find planets in orbit around other stars and the real possibility of life beyond the Earth. It's no surprise, then, that students, writers of fiction and nonscientists in general are so interested in this particular scientific endeavor. That's why we, as astronomers, are so anxious to "get the word out," as they say. And that's the purpose of this site. 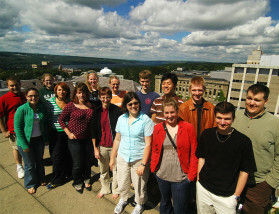 When you send an astronomy question to us, it will be forwarded to one of the participating scientists here at Cornell. Most of us are graduate students studying for PhDs in astronomy, and all of us are actively involved in astronomy research, but we love to take time out from our work to share our knowledge with those who are curious. The Ask an Astronomer team, November 2012. Here some of us are in Room 105 of the Cornell Space Sciences Building, after another weekly astronomy colloquium. From left to right: Sean Marshall, Patrick Lii, Jim Fuller, Drew Brisbin, Manolis Papastergis, Luke Leisman, Betsey Adams, Mike Jones, Joyce Byun, Everett Schlawin, Tyler Pauly, and Amit Vishwas.Ask an Astronomer is run by volunteers in the Astronomy Department at Cornell University. There are several astronomers involved in maintaining this site and answering the questions sent in. Most of us are graduate students at Cornell, and all of us do this voluntarily, in our own time, fitting it in around our other work. We ask that you take this into consideration when sending in your questions, especially if you are a teacher using this site as part of a class. Please take the time to browse our site and first try to search our site and other sites (with your favorite search engine) to find an answer to your question. In September 2001, with seven people involved in "Ask an Astronomer" (Lynn, Malia, Karen, Jagadheep, Dave R., Britt, and Kristine) we decided that it was about time we updated the website. Some previously answered questions had gotten very out of date, and we thought that it might be very helpful if we put more information on the site to help circumvent some of the most basic questions. That updated site was launched to the public on May 1st, 2002. The Ask an Astronomer team, September 2015. Here some of us are in the Cornell Space Sciences Building, after lunch. From left to right: Cody Lamarche, Sean Marshall, Tyler Pauly, Mike Jones, Matt Hankins, Michelle Vick, Michael Lam, J.J. Zanazzi, Sam Birch, Nic Kutsop, Georgios Valogiannis, Thea Kozakis, Jack Madden, Victoria Calafut, Avani Gowardhan, and Paul Corlies.The website got another major update in February 2015, and that new site is what you are looking at now. "Ask an Astronomer" has continued to flourish, and now in 2016 we have roughly fifteen graduate astronomers on hand to answer questions and update the site. Please note: Most of our questions and answers, but not all of them, have been checked recently (June 2015 or later), to ensure that their information is up to date. All answers that have been updated since mid-2015 should have a note at the end saying something like "This page was last updated on July 1, 2015." The remaining answers should be updated within the next few months. Please use the drop down menu below to read more about the individual astronomers who answered the questions on this site. The Cornell Daily Sun wrote an article about us in May 2002 and another in August 2002. The Cornell Chronicle wrote about us in their Sept. 26th 2002 edition. The Houston Astronomical Society picked us as their "Site of the Week" for September 22nd-29th 2002, and the Amateur Astronomers Association of NY picked us as their "Web Site of the Month" for January 2003. Also, Sun Newspapers (from the Twin Cities area in Minnesota) named us their "Sun Spot of the Week" in July 2003. Ask an Astronomer was awarded the Griffith Observatory Star Award for the week of January 11-17, 2004. Science magazine picked us as one of their featured NetWatch websites in May 2004. Cornell's College of Arts and Sciences wrote an article about our upgraded website in June 2016. "After teaching for 17 years, I have myself teaching 8th grade Earth science for the first time. Needless to say, I had to learn more than anyone else. Your website has been such a valuable resource for me, and I just wanted to thank you for providing it." "Twenty years of television hasn't been able to reveal to me what 5 minutes at your site has. It is truly wonderful to be able to browse through your site and see such well constructed answers to common and obvious questions that, I imagine, so many people like myself have asked themselves at different times by simply looking up. Well done and thank you." "Thank you for taking the time to create such a beautiful and wonderful web site. Someday people will realize that the greatest joy in life is shared observations and knowledge; greed, power and prestige will be a thing of a barbaric past. Thank you again for your kindness." "Thank you so very much for your answer to my question. I think now I have a better idea or at least can in my mind visualize how this came about. It is something that I have thought about for a long time and you are the first one make it clear. You are also the first astronomer I have ever talked to. At 60+ years of age and with a limited education it is difficult for me to understand something that I can't visualize. I'm sure this is why so many people turn to half-baked 'science' to explain to them what they can't understand. THEY make it easy and if not it's the government anyway." "This is not a question, but a comment. I was trying to help my 6th grade son with his astronomy project, and we happened upon your website. Just wanted to say that it answered all of his questions, and that it's quite thorough and well done.. Kudos to the contributors!" "My six-year-old wanted to know about the temperature of differently colored stars. I found this explanation so fascinating: What is the life cycle of a star? that I read the whole thing to him. He dashed off a picture, his interpretation of a red giant, having engulfed the planets of the solar system and about to go super-nova. Thanks for the very well-written explanations." "Thank you for your time while answering my questions! And thank you, the astronomers, for devoting your lives to unlocking the mysteries of the universe. You inspire me. It's so odd because the next day in my science class the next chapter we're learning all about astronomy. Now I'll have something very intelligent to tell my teacher thanks to you." "What a GREAT web page! It would certainly make me want to include a trip to Cornell's Astronomy Department in my lesson plans! I'm glad my suggestions helped, and I really do think it's a strong, welcoming site for teachers. I was soooooooo flattered that you included me and Senior High -- I'm sure it won't take long for you to find a science class to take our place, but the recognition is really something. I would like to share it with our science department, and my German students as well. Thanks for that :) !!!" "I wanted to thank you for sending me the information about gravity. I was able to complete my science project. Everyone got a certificate and a red ribbon. I want you to have a picture of my project. I put Polly Pockets on the paper mache earths I made to show how people always walk upside right on the earth. I also included a picture of me. Thank you!" 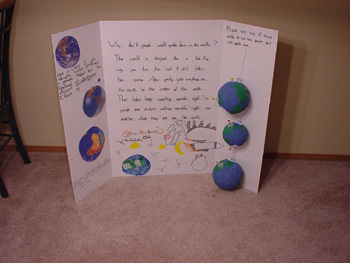 A picture of the project described in the letter above. What a great project, and congratulations on your red ribbon! "Thank you for what your site offered to my family. It comes through on your website that you love to think, love to learn, and love to teach. What a pleasure!" Our logo is inspired by the Big Dipper. We have chosen the seven brightest stars in that constellation and connected some of them with lines to look like a question mark, which represents the natural curiosity people have about the stars and our efforts to provide answers!